This week it’s Phil Collard who took part in the Titan Weston with us last year. “I was diagnosed with cancer at 18 months old and given only a 50/50 chance of survival. Thankfully, clearly, I did survive and made a full recovery to all intents and purpose. Aside from regular hospital check-ups (I was breaking new ground a bit since the operation that saved me had only been in existence for a few months prior to my having benefited from it), my childhood was pretty much normal. In my early teens, however, it was discovered that the radiotherapy I’d had as a baby had weakened my right hip such that it effectively broke itself and, for a moment, it looked as if I’d never walk again. They pinned my broken hip back together and I recovered again – returning to cycling (which I’d enjoyed throughout my teens to that point) and, ultimately, to Motorsport where I competed for a few years and even became a national champion. Having had the hip operation in my teens, however, it was hugely open to becoming arthritic – which it did – and by the time I was 33 (by which time I was married to Lisa and had a son, Angus), it was so bad that I could hardly walk and, again, a horrible conversation with a specialist resulted in me preparing to spend the rest of my life in a wheelchair. A genius surgeon had other ideas and said that we may as well try a hip replacement – the result couldn’t be any worse than life in a wheelchair, after all… and thankfully, the result was so much better and he really gave me my life back. I remember him telling me that my new hip would last between 15 and 20 years and I remember replying that I’d rather live life to the full with it and have it last 15 years as opposed to protecting it by doing nothing and having it last 20 years. 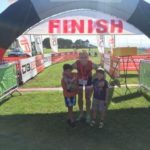 And so I did – I returned to cycling and then (against medical advice, to be honest, since running is a strict no-no) Triathlon and dragged Lisa, Angus and my second son, Evert (named after my hip surgeon) all over the place as my loyal support crew. And I’m always on the lookout for what challenge to do next which is why Titan Weston caught my eye… especially since it’s so local to where I live. As a post script, Lisa and I set up a charity (Honeybones) to educate, support and inspire people (of all ages) who have conditions affecting their bones and joints – notably, we were extremely proud to be able to assist a young lad with Perthes Disease to buy a sports wheelchair. Lastly, I published a book about my Ironman journey (On Days Like These https://www.amazon.co.uk/dp/1849145415/ref=cm_sw_r_cp_api_BWq4xb3YQ6BY6) which has been sold around the world”.